This unique gold pendant relates the story of the Grandfather Fire of all Anishinaabe Peoples, regardless if they live in the eastern part of Turtle Island or inhabit the shores and islands of gichigamiin (the Great Lakes) - where the jeweler's ancestors moved after a prophecy related to them two millennia ago. When the Great Nation of WAABANAKI was first created, they were placed along the shores of the Great Salt water (Atlantic Ocean). Here, in WAABANAKI (the Land of Dawn) the great nations of the Lenni-Lenape, Abenaki, Mi’kmaq and Omàmiwininiwak (Algonquin) lived a long time in peace and prosperity when NIIZHWAASWI MISHOOMISAG (seven prophets, grandfathers) came among them in the form of seven Miigis shells who taught the MIDEWIWIN way of life to the Waabanakiing peoples. They also brought with them instructions of the SEVEN FIRES, telling the People to move westward, and to follow seven signs. Not all Waabanakiing peoples believed in the prophecies, but those who did began a 1500-2000 years lasting migration marked by ‘fires’. Along the migration small family groups of clans stopped and set up permanent settlements while the larger body moved on. Also they set up Midewigaanan, lodges of the Midewiwin (Grand Medicine Society), providing an institutional setting for the teaching of the world view and religious beliefs he Waabanakiing People had brought with them from the old country. In the period of the second fire, about 700 summers ago after reaching Lower Peninsula of present-day Michigan, three groups began to emerge from the Waabanaki Nation, or as they had started to call themselves, Anishinaabeg: the OJIBWEG, appointed as ‘Faith Keepers’, or keepers of the Algonkin religion and caretakers of the Sacred Water Drum of the Midewiwin; the ODAAWAAG (Odawa) or Trader People, responsible for sustenance; and the BODWE'AADAMIINHK (Potawatomi) or People of the Fire Pit, who came in charge of the Sacred Ancestral Fire. These three Anishinaabe groups formed a loose political-military confederation, called the NISWII-MISHKODEWIN (Three Fires). The confederation of the Three Fires is still very much alive today! The fire in the overlay design symbolizes the original council fire of the Lenni-Lenape, the ancestors of the Ojibwe Anishinaabeg, when they still lived in Waabanaki, the old country in the east. The Lenape were regarded by all Algonkian nations (such as Mi'kmaq, Omàmiwininiwak and Abenaki) as their grandfather, their ‘first among peers’. It was a term of great respect stemming from the widespread belief that the Lenape were the original People of all Algonkin-speaking peoples. This ‘grandfather fire’ thus predates the founding of the Three Fires Confederacy. 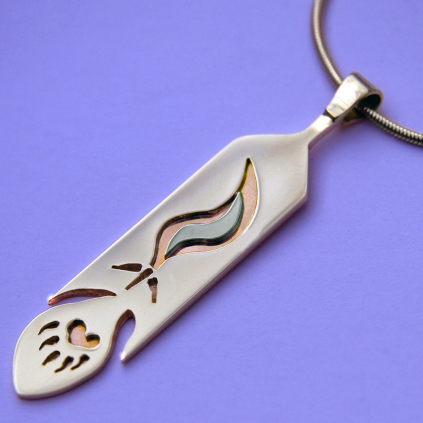 The tripartite design that the jeweler depicted beneath the fire hints at the dividing of the Waabanaki/Algonkin/Anishinaabeg into three different nations and the founding of the Three Fires. Finally, the eagle feather and the bear paw combined stand for the strongest medicine and ultimate power.